Gudeg is one of some special foods from Jogja. It is just like Sate (roasted beef in stick) from Madura and Pempek from Palembang, Gudeg Jogja has been well known in Indonesia, even in other countries. In Jogja, Gudeg has been widespread in almost every area, from the Gudeg center on Wijilan Street to other places. A lot of cafes or small restaurants serve Gudeg with various tastes, surely the prices follows, especially at Wijilan Street. Besides tasting the Gudeg, we can find many kinds of special traditional handicraft. Vendors of Gudeg usually attract the customers’ attention by making an attractive packaging named kendhil (a clay-made package). It does not only make the serving become more attractive but also makes the taste become more delicious. We can find the Gudeg Kendhil in almost every place which serves gudeg. Gudeg is made from unripe jackfruit boiled with special spices and coconut milk (santan). The top and the bottom parts of the pan used to boil the spices and the coconut milk (santan) is covered with unripe Jati leaves. To get a perfect and delicious taste and color of the Gudeg, those ingredients are boiled all night. The Jati leaves are used to get an attractive color. The areh or sauce is made from coconut milk (santan), spices, and turmeric as the artificial color. It is poured on the ready-to-serve Gudeg. The Gudeg itself has a sweet taste. 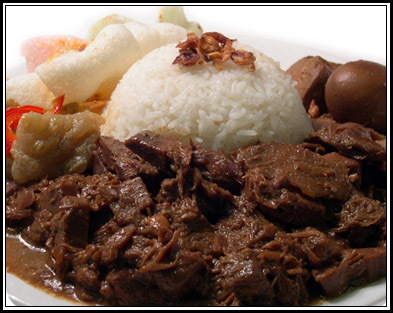 Gudeg is usually served with warm rice, egg, chicken, ceker, tofu, tempe, chip, fried onion, etc. We can also serve a glass of tea, ice tea, orange juice, fresh water, etc for the beverages. It is not complete if we come to Jogja without tasting Gudeg.